Lately, I have been wondering about those patterns. I have been wondering if we inherit misfortune, the way we inherit eye color, hair color, left handedness. 2. He died in the same hospital where he was born. He died in the hospital where my mother was born 11 years later. Magin LaSov Gregg lives, writes, and teaches in Frederick, Maryland. Her writing has appeared or is forthcoming in The Washington Post, The Huffington Post, The Rumpus, River Teeth’s Beautiful Things, Pithead Chapel, Hippocampus Magazine, and The Bellingham Review. She blogs at www.maginlasovgregg.com and tweets @maginlasovgregg. 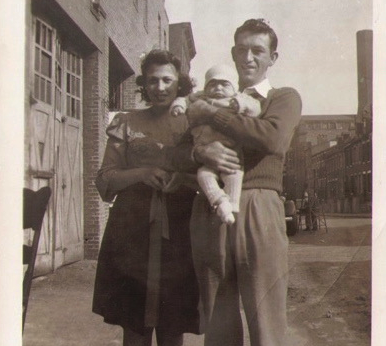 Photo provided by the author of her grandparents and baby Bernard in 1942.